… at some of Wall Street's biggest firms, including Wilshire Associates, which provides services to clients in 20 countries representing assets totaling approximately $8 trillion. Maybe you've caught one of his regular guest appearances on FOX Business Network's "Varney & Co." – the highest-rated market program on television. It's true that for much of his career, he was someone who helped the rich get richer. But now you'll hear him singing a different tune. He doesn't have to tell you that doubling, tripling, and even quadrupling your monthly income would make your life a lot easier. What would you do with the potential annual income boost? Wouldn't boosting your income have a great impact on your life? In a moment, he'll show you two $200,000 one-time "paydays" you could potentially take advantage of, starting today. Look, no one is going to tell you how to spend your money. These are all freedoms that people who have "total income security" enjoy. … potentially multiple passive income streams. That way, if your main source of income dries up, you have several others funding whatever lifestyle you choose. 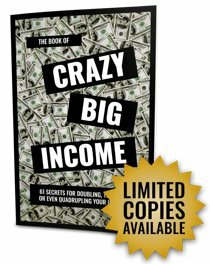 That's what your free copy of "Crazy Big Income" is designed to help you do. In it, Keith reveals dozens of ways that you could sit back and receive multiple checks… from multiple sources every month.